and was awarded medals by both countries, including the Iron Cross 1st Class." Herbert Sulzbach was born in Germany in 1894. He volunteered for the German Army in 1914 and served until 1918. 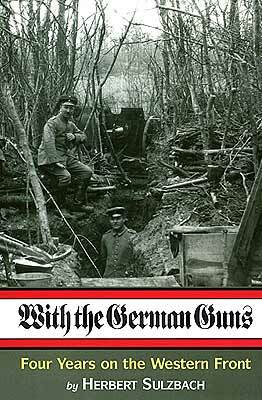 He kept a diary during the First World War and this was published as With the German Guns, Fifty Months on the Western Front, 1914-1918 in 1935. Herbert Sulzbach was an interesting guy. Joining the German artillery at the beginning of World War I, Sulzbach fought through the entire war without a scratch, in the process winning two Iron Crosses. After the war, after fleeing the Nazis and emigrating to England, Sulzbach joined the British army, ultimately being commissioned as an officer during WW II. Following his second world war with his second army, Sulzbach returned to Germany, where he worked for the rest of his career as a cultural officer for the German government, eventually being awarded the Paix de l'Europe medal for the promotion of cross-cultural understanding. Sulzbach was a notable man living in notable times. However, it was with the 1935 publication of his Great War memoirs, With the German Guns, that Sulzbach first gained his notoriety. This intimacy is both the book's main strength, and its weakness. It is hard not to like Sulzbach. His writing style is fluid, and observations are both touching and personal. The intense intimacy creates a bubble dividing Sulzbach, and the reader, from the big picture. He gives us brief impressions without providing a context in which to frame these impressions. Combined with his remarkably intact naiveté, this lack of context leaves the reader feeling somewhat lost in space and time. The end of the war comes as a complete surprise, because as far as Sulzbach is concerned, Germany has always been the complete master of the battlefield. I don't want to give the impression that I didn't enjoy reading this book. It is a fine portrait of the strength of the human spirit when all around him is chaos. Perhaps that is what it was intended to be. However, it is not a book to read for the who, what and how of First World War history. He was born February, 1894, into a wealthy and respected Jewish family of Frankfurt-on-Main. His grandfather, Rudolf, was the founder in 1855 of the Sulzbach private bank (Bankhaus Gebruder Sulzbach), one of the founders of the Deutsche Bank-today one of the 'Big Three' German commercial banks-as well as a partner in a number of other major industrial undertakings. He was offered a title of nobility by Kaiser Wilhelm II, but refused it. Herbert's father, Emil, inherited the family business which was recently taken over by the banking firm of Oppenheim. He died in 1932, on the eve of the Nazi seizure of power. Frankfurt named a street 'Emil Sulzbach-Strabe' in gratitude for his contribution to Frankfurt's cultural life. Herbert Sulzbach volunteered for military service at the outbreak of the war in 1914 and was accepted in the 63rd (Frankfurt) Field Artillery Regiment on 8 August. Four weeks later he was on his way to the Western Front. He was to stay there, but for one short spell of service against the Russians, for the next four years. He won the Iron Cross, second class, in the Battle of the Somme in 1916, and the Iron Cross, first class, after the bloody Battle of Villers-Cotterets in 1918. He received the 'Front-Kampfer Ehrenkreuz' (Front-line Cross of Merit) from Field-Marshall Paul von Hindenburg, later to become President of the 1919-33 Weimar Republic. Among his war-mementoes is a letter from Field-Marshall Ludendorf, with photograph, thanking him for his zeal in discovering the wreckage of his dead stepson's aero plane. Years later, in 1935, his own wartime diaries were published under the title of 'Zwei lebende Mauern' (Two Living Walls). The book received enthusiastic reviews, even from Nazi newspapers and journals-whose editors must surely have been unaware that the author came from a Jewish family and therefore a supposed and proclaimed enemy of the German race. The Berlin publishers, Bernard and Graefe, included "Two Living Walls" in a prospectus of three specially recommended books. Ironically the other two were profusely illustrated short biographies of Hitler and Mussolini. He had to leave, and he chose to go to Britain. One reason-in spite of having fought for four years against the British, he had an admiration and even a feeling of affection for them and their country. And, a more mundane consideration, he had built up a firm in a Berlin suburb, making fancy paper for box coverings and book bindings and doing a busy trade with Britain. A Branch of the firm was opened in Slough, offering at least a chance of a living. Just before this, Herbert Sulzbach had in fact been accepted for military service; his desperate efforts to volunteer had at least been taken at face value. He joined the Pioneer Corps as a private and spent much of the next four years building defenses against possible German landings from sea or air-a strange contrast indeed to his four years of fighting on the Western Front from 1914 to 1918! As the chances of German landings became ever more remote, his work became increasingly unrewarding. He made it his business to talk and reason with the 4000 men in his charge. Many of them were red-hot Nazis; quite a few were members of the Nazi fighting-elite, the 'Waffen S.S.', an organization proscribed as criminal by the Nuremberg War-Crime Tribunal after the war. The task which he undertook was daunting; he discharged it with immense and infectious enthusiasm, with great patience and with an absolute belief in the virtues of the democratic way of life which he made it his duty to explain. 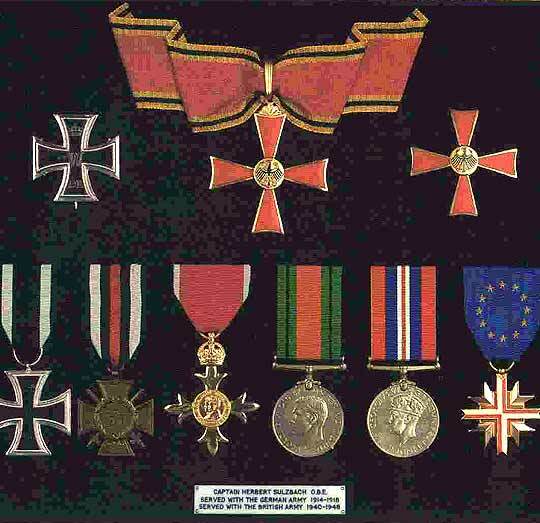 To his Iron Crosses of the First World War, Herbert Sulzbach has added the German Cross of Merit 1st class and recently, the Grand Cross of the German Order of Merit to wear alongside his British medals of the Second World War. Granted British citizenship in 1947, he was given back German nationality, filched from him by Hitler, in 1952. For the last two decades he has had two 'fatherlands' and his love of both has reinforced his belief in the future of Europe. The man who has worn both khaki and field-grey has come a long way; his war diaries are a major episode on a road which he has trod with great good humor and honest courage. After the war Sulzbach worked for the German Embassy in London. Herbert Sulzbach died in 1985.